If you’ve ever experienced issues with your mental health, then you know how differently it’s treated than our physical health. By doctors and health insurance companies, by employers and managers, by the press and the general public. Yet, they’re not separate. They’re simply two different aspects of our overall health; and they heavily influence and affect each other. People share their thoughts about mental health with those who are experiencing issue much differently than they do with friends, family, colleagues, and others with an illness or who are physically injured. Love this post and the full version of the photo above. 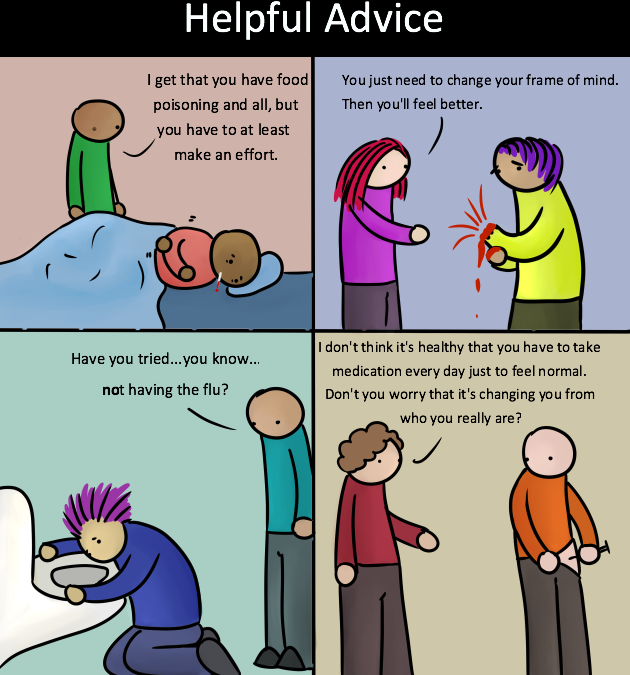 What if we treated physical health like many people treat mental health? These may be eye opening for those who think mental health issues are a weakness. And validating for those who’ve experienced such issues. In the U.S., a study shows that 6.4% of workers have had an episode of major depressive disorder, averaging five weeks of lost productivity. This results in an estimated human capital loss of over $36 billion a year. From just this one mental health issue. 35-45% of absenteeism from work is for mental health issues. More than two years after an EF5 tornado, with winds over 200 miles an hour, devastated Joplin, Missouri, a study showed that 13% of individuals were experiencing depression. And that 27% had probably post-traumatic stress disorder (PTSD). The Substance Abuse and Mental Health Services Administration (SAMSHA) recognizes that after a major disaster (like a natural disaster or terrorist attack) there will be between 4 and 50 psychological injuries to every one physical injury. These issues are treatable. Discovering that you’re experiencing a mental health issue is not fundamentally different than finding out you have a physical health issue. It may go away on its own after a short period of time without intervention, like a cold or flu or scraped knee. Or it may be more serious and require professional assistance, like a broken bone, diabetes, or cancer. Mental health is just health. Like heart health is just health. Like reproductive health is just health. Therefore, the more we can think about it like we do our physical health, the better chance we have. Of reducing the stigma surrounding mental health issues. And of getting the help we need to recover the best we can, as quickly as possible.